Opening Your Cottage This Spring? Our team can help you get the job done right! 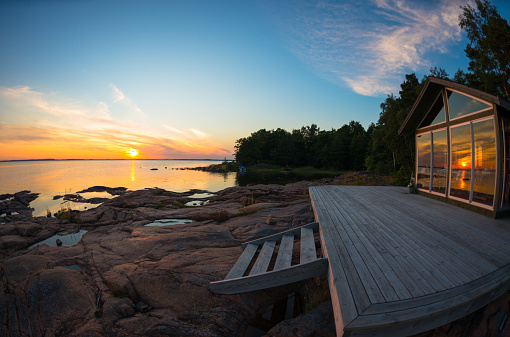 Opening your cottage in the Spring is an exciting but critical step for every cabin owner. Gravenhurst Plumbing Heating & Electric can help you open your cabin to ensure a thorough job is done. If your cottage is in the Muskoka, Gravenhurst, Huntsville, Orillia, Kawartha, or surrounding regions, give us a call. We would be glad to assist you with opening your cottage! Main power has been left on _____ off ____. Hot water tank has been filled ____ not filled ____. Power to the hot water tank has been left on ____ off ____. Power to the water pump has been left on ____ off ____. Water system has been primed and checked to be operating properly ____. The water treatment/conditioning system has been checked ____ N/A ____. Sediment filter has been changed, yes ____ no ____ N/A ____. Ultraviolet bulb has been changed, yes ____ no ____ N/A ____. Sterasyl filter has been changed, yes ____ no ____ N/A ____. Washing machine has been cycled and is okay, yes ____ no ____ N/A ____. Dishwasher has been cycled and is okay, yes ____ no ____ N/A ____. Sewage system has been checked and is ____ is not ____ operating properly. Power to the sewage system has been left on ____ off ____ N/A ____. The invoice for the spring 2017 water turn-on will be mailed to your home address. We thank you for your business, please call us at (705) 687-3402 with any questions. Fill out the form below regarding this service and we will get back to you asap!